The land is thirsty. Called by the Old King, the beardy shaman wizards must summon a great storm. Let Juju dice rain! 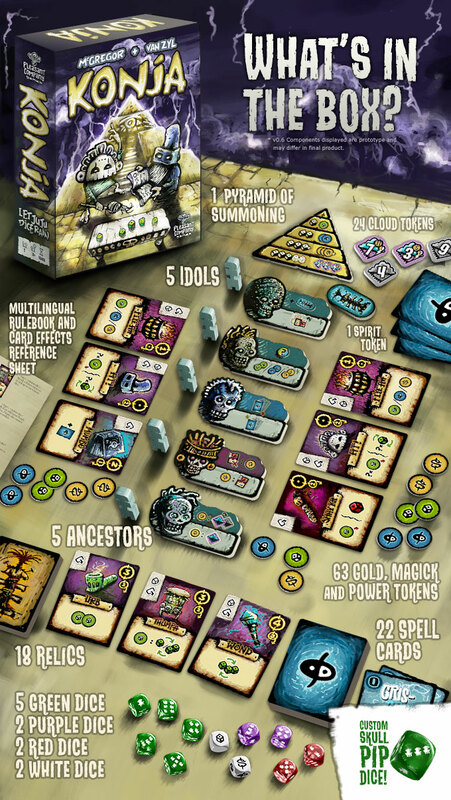 Each turn in the game, a wizard will invoke the Favour and Blessing of an Ancestor, roll dice, activate Spell and Relic cards, and exchange combinations of dice for Clouds (worth points) and resource tokens (that help with future dice rolls). You will need a combination of clever tactics, shrewd timing, careful resource use, and a bit of luck to win the game. The first wizard to summon Clouds totaling at least 21 points, awakens Xango, the ancient God of Storms, and brings rain to the parched land. He possible would be you to put has arrangement a file pdf sticker of konja of the campaign to kickstarter. The Konja Idol stickers will be available on our new webstore at the end of January 2018. 1 Pings/Trackbacks for "Konja (2017)"